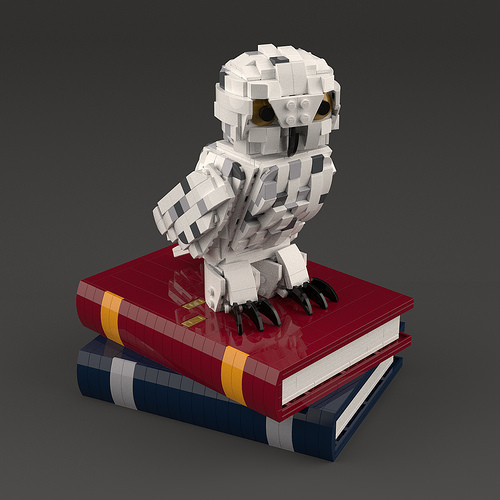 Builder spacehopper’s digital LEGO version of Hedwig finds Harry Potter’s snowy owl elegantly perched on what I hope is a copy of A History of Magic. 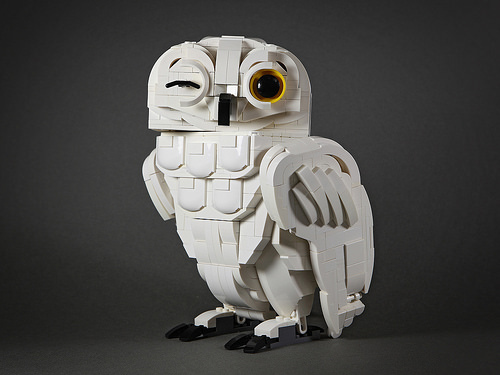 Although relatively small in scale, the use of slopes in varied shades of grey and white effectively suggest feathers. This works well when contrasted with the more formal tiled technique used to create the magical tomes; I especially like the gold ingot elements added here to give textural detail to the book’s cover. Simple inset amber eyes, so often referred to by J.K. Rowling in her novels, complete the build, bringing Harry’s faithful companion to life.